How to show the other side of the argument in an opinion essay. In an opinion essay you need to clearly state your opinion, back it up with details and give examples. I usually advise my students to choose one side, either agree or disagree, and stick with that. 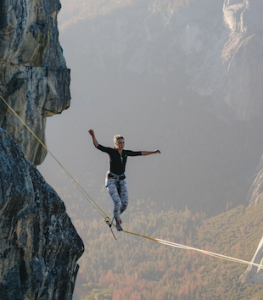 You do not actually get a higher band score for a balanced approach so it is safer to choose one side and stick with that view throughout the essay. Remember that your opinion must be in the introduction, body paragraph and conclusion. However, something that will showcase your language ability is to show the other side of the argument, this helps to balance the essay. 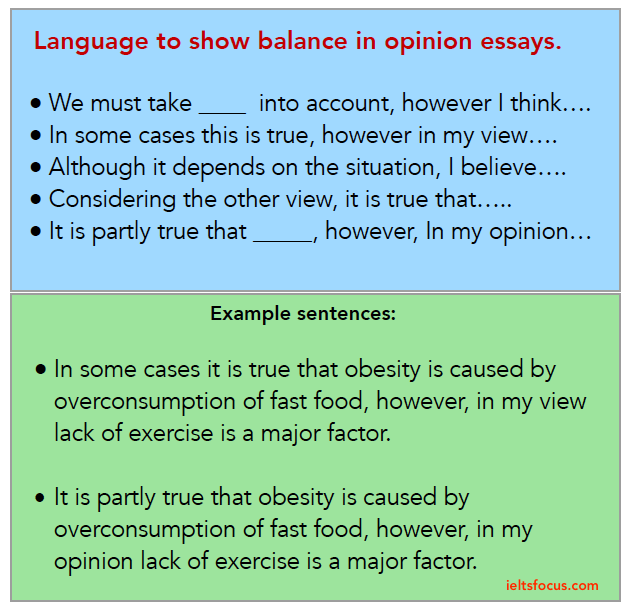 This can give the essay good coherence and you can demonstrate your grammar skills if you have strong grammar. However, this should be done carefully, because you still have to maintain your own opinion and not contradict yourself. I firmly agree / believe…. KEY POINT: Remember that these phrases are not just to be memorised, you will have to practice how to use these naturally in your writing. If you just memorise phrases and put them in an essay the examiner will spot it. Here you can see how this is used on a sentence level, these are sentences taken from 4 different IELTS essays. 1. I think that obesity is caused by over-consumption of fast food, although we should take into account the issue of hereditary factors which are very real. 2. Serious crimes in my opinion need to be punished by long prison sentences, however, considering the other side of the argument, this might not be effective in bringing down the crime rate so other measures need to be taken. 3. I believe that children need lots of homework to test their abilities so they can get good grades, on the other hand, there needs to be a balance of free time so they can play and explore with friends. 4. In my view, I think that working from home is better than working in an office. However , others might say it is easy to lose motivation when working from home. For instance, getting distracted by watching TV or using Facebook. Conjunctions like ‘Although’ and ‘However’ are very useful when you want to show contrast. I have underlined them in the examples sentences above. When we give the other side of the argument, it is important to make your own opinion very clear in the body paragraphs and conclusion. If the question asks for your opinion you must give it directly, a discussion essay has a different structure, but also discussion essays often ask for an opinion.. read the instruction words carefully first. Practice using these phrases in your writing and adapt them to your own style. Do not just memorise them and plant them in the essay because the examiner will see that and you can lose points. Let’s look at 2 types of introduction that can be used here, one of them is a straightforward opinion, the other balances the opinion with the other side of the argument. 1. Some people would argue that violent sports such as boxing or combat sports ought to be prohibited from global sporting competitions. I disagree with this view because these sports can teach discipline and strength of character. 2. Some would argue that violent sports such as boxing or combat sports ought to be prohibited from global sporting competitions. I disagree with this view because these sports can teach discipline and strength of character, however, we must take into account the psychological effects on children if they watch them on TV. In example number 2 I added the contrast device ‘however.’ and then I wrote ‘…we must take into account… ‘ , in this case I am showing the other view , but I will still have to reinforce my opinion again in the body and conclusion. It is important to keep the introduction concise. In example 2 above the introduction is 52 words which is a bit long. You can also use this technique in the body paragraphs instead of the introduction if you feel that the introduction becomes too long. Remember though that you must restate your opinion and be careful not to contradict yourself. This is how I would reinforce my opinion in the conclusion. To conclude, although it is partly true that aggressive sports have a negative psychological impact on youngsters watching them on TV, I firmly believe that these sports should not be banned from international sporting events, because boxers and fighters learn strict discipline and inner strength. I used the conjunction ‘Although’ and then the phrase ‘it is partly true …’ then in the blue sentence I state my opinion using ‘I firmly believe that..’ This method shows balance and I am clearly asserting my opinion again with some detail. Note: The conclusion is 44 words here, make sure your conclusion is shorter than the introduction. There is no need for too much detail in this stage. Here are some sentences taken from introductions and body paragraphs , Fill in the gaps with the best phrase from the box below. 1. I think that the government should not control what we see on the internet, although ____________ , such as dangerous websites with harmful content, there needs to be regulations put in place. 2. In my opinion there are many benefits to running your own business, _____________ there are risks involved and working in a company tends to be more stable employment. 3. I believe that capital punishment is not an effective way to deal with serious high profile crimes and more humane punishment must be used, whereas _________________ capital punishment does indeed act as a major deterrent. For instance, in countries which have the death penalty it has shown evidence of lower serious crimes. 4. I think that the government needs to invest much more in public transport, but _________________, some feel that investing in healthcare is more important because peoples health is a much greater priority. 5. In some cases, criminal activity should be dealt with by longer prison terms, however, ____________ this is not the best solution and other alternatives need to be explored such as community service for petty crimes. 6. I agree that getting a University degree can help secure a good job, however, practical real life work experience should also be __________________ . Click on the orange button below to see my answers, note that some answers may vary. If you have questions put a comment in the comments section at the end of this post. You have to develop your own style so that these phrases can be used naturally , just do not memorise them and put them in your essay randomly. 1. I think that the government should not control what we see on the internet, although in some cases, such as dangerous websites with harmful content, there needs to be regulations put in place. 2. In my opinion there are many benefits to running your own business, on the other hand there are risks involved and working in a company tends to be more stable employment. 3. I believe that capital punishment is not an effective way to deal with serious high profile crimes and other more humane punishment must be used, whereas others might say that capital punishment does indeed act as a major deterrent,for instance in countries which have the death penalty it has shown evidence of lower serious crimes. 4. I think that the government needs to invest more in public transport, but considering the other side, some feel that investing in healthcare is more important because peoples health is a much greater priority. 5. In some cases, criminal activity should be dealt with by longer prison terms, however, in my view this is not the best solution and other alternatives need to be explored such as community service for petty crimes. 6. I agree that getting a University degree can help secure a good job, however, practical real life work experience should also be taken into account.